Happy Publication Day to A.J Cross! We are delighted to celebrate the mass market publication day of Gone in Seconds by A.J Cross! Anne stopped by to chat to Camilla Wray about her first year as a published author. Congratulations on the mass market publication of Gone in Seconds. How has your first year as a published writer been? Thank you! It’s been amazing for several reasons: firstly, when I sent off the first three chapters of Gone in Seconds I didn’t for one minute expect anything to come of it. Now Gone in Seconds is ‘out there’ and to some degree so am I. Maybe all writers feel the same: you work away in your room and next thing there are nice people taking an interest in what you’ve produced. Because I was featured in Woman Magazine people where I live in Birmingham recognise me and stop me in the street or in shops to ask all sorts of questions, most often ‘When is the next one due?’! Has the experience been different to what you expected? I didn’t know what to expect! I suppose I’ve taken to it because it’s so great to have Gone in Seconds out there. There are still the odd moments, usually when I get an email from you or Orion my publisher telling me about some new development such as an audio book of Gone in Seconds being released. At those times its like everything stops for just a moment and I think “I can’t believe this. I’m in some kind of fantasy I never even had.”! Are there any parts that surprised you? Most of what I’ve already said, plus every time someone comes up to me or emails and says how much they enjoyed Gone in Seconds and couldn’t put it down – I’m getting slightly used to it now because I know I wrote it from the heart but those comments are still lovely to hear and a bit humbling. What’s next for A J Cross and Dr Kate Hanson? After years of doing other kinds of work I’ve now realised what I really want to do: write, and write some more. As for Kate, I believe she has a lot of ‘life’ in her because she’s a very strong, very dynamic female. I can foresee changes in both her professional and social life. 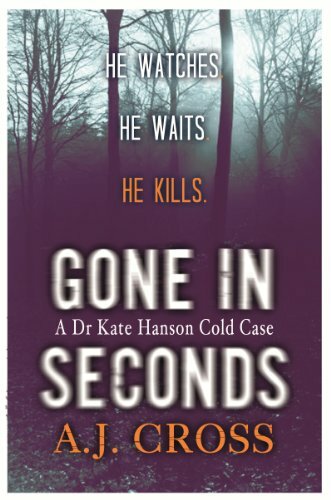 In Gone in Seconds Dr Kate Hanson’s personal life and especially her relationship with her daughter Maisie is an important part in giving the extra element to crime fiction. Is that something you set out to do? Because it was written from both the heart and from the experience of being a Forensic Psychologist I don’t think it’s something I set out to do. I knew it was inevitable that Kate would experience anxiety and fear for her daughter, over and above those we all have for our children, because she knows the depths of depravity in some people. I can’t imagine Kate ever losing that fear. It may even grow as time goes on and Maisie has increasing freedom. Kate also has her own problems: her difficulty of trusting men and of making a commitment. I see these facets of her experience and character as abiding themes in her life – I’m anticipating that nothing is going to be easy for her. Is Maisie a character the reader will get to watch grow up, like fans of Patricia Cornwell found with Kay Scarpetta’s niece Lucy? Definitely. It seemed to me to be really necessary in a book series to show the passage of time to keep it dynamic. The two younger characters, Maisie and Julian, are those whose development is going to be most evident, although my thinking is that this will happen to a degree with the other central characters, regardless of age because that’s life, isn’t it? Another reason why Maisie is here for the long-term is that my sister-in-law who kindly donated her name to the character is expecting it! You have a really interesting past as a Forensic Psychologist. Is it hard to keep a balance between authenticity and pace when you’re writing because you know so much about what you’re writing? This really is one of the tensions inherent in what I’m doing: I have specialist knowledge from my work as a Forensic Psychologist but at the same time I know that a ‘good read’ needs pace and urgency. I want what I write to be realistic because I think it’s what readers expect but it’s not possible to fully convey, for example, the finer points and degrees of a personality disorder. Some readers might want that but I suspect most can do without them. I try to focus on keeping it all as ‘real’ as I can within the confines of novel-writing. Occasionally I express my own view by having the pathologist character bemoan the unreality of CSI! Reading Gone in Seconds is like watching a great TV drama; do you get inspiration from TV and films? Thank you! Less so from films, I think. I’m a great re-reader of crime ficiton and a re-watcher of the TV crime I record. My all-time-favourite is Inspector Morse. It took me a long time to figure out that it was the two-hour format which enabled the writers to develop rounded characters who interacted with and talked to each other in a way which felt believable, plus it was a master-class in conveying all of that interaction in an economical way, which isn’t easy. Is there anything you’ve watched recently that made you sit up? Yes: I loved Broadchurch because it tapped into two aspects of my own writing: it was character-led with the two main characters having major flaws but still managing to do their jobs. Kate is flawed, plus she gets really irate if she thinks people aren’t doing what they’re supposed to do. I like her a lot but I’m guessing I might find her difficult to work with at times. I also enjoyed The Fall because of strong characterisation. I’m aware that it has been criticised for its depiction of violence towards women. It’s a thorny topic because women (and children) are unfortunately victimised because of their vulnerabilities. There’s no getting away from that but watching the series made me realise that one of my aims is to show the violence in my writing as ‘real’ but not gratuitous. So far, I think I’ve pulled off that difficult trick. You’ve got great titles. How do you think of them? I’ve discovered that I must have a title almost from the start. It helps me structure what I’m doing. Gone in Seconds was a little late in coming, I’d say half way through, because I was trying to come up with the whole thing. Then I started to really think about what I was trying to say through the book which led to a lot of playing around with single words and thinking about the various characters. Once I’d realised that, Art of Deception came much more easily. I’ve noticed a trend: three-word titles! I like the rhythm of it. My third book which I’m currently writing is The Prosecutor Complex so it’s a continuing trend. Day or night? Day and night. Busy in one and unconscious in the other. Coffee or tea? Coffee. I need the ‘belt’, the hit. Music or silence: Love music. Can’t stand to hear it when working. Musician husband has music as a constant even when not working. It’d drive me nuts. Pen or keyboard: Keyboard. Being a left-handed shorthand writer my actual writing is a car crash. Half of the time even I can’t decipher it. Hanibal Lector or Buffalo Bill? Hanibal. People who can present as ‘normal’ when they choose are the most scary. Kay Scarpetta or Temperance Brennan? Temperance for me. More grounded. I have difficulty with people who fly around shooting people and I can’t understand the technology bits. This entry was posted in Darley Anderson Authors, Interviews and tagged A. J. Cross, camilla, crime. Bookmark the permalink. 1 Response to Happy Publication Day to A.J Cross! your book , gone in seconds, in one word, fantastiic!!! go so on.in dutch is the name of your book:in het niets verdwenen.